This page is for the Director's Cut. For the original release, see Strike Suit Zero. The Director's Cut includes updated graphics, a restructured campaign as well as the Heroes of the Fleet and Raptor DLC of the original game. Multi-monitor options can't be changed during a mission. 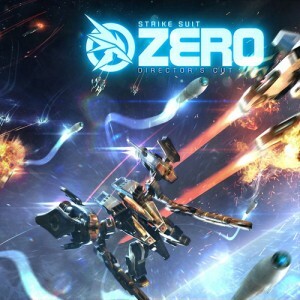 Mods for Strike Suit Zero don't work with the Director's Cut. Includes the original Strike Suit Zero with the Heroes of the Fleet and Raptor DLCs as an extra. In-game mouse and keyboard control settings. Input has to be changed to controller in the control settings. Select Joystick + Keyboard input setting. Error creating thumbnail: convert: Expected 8192 bytes; found 8056 bytes `/tmp/localcopy_616077cbf1f7.png' @ warning/png.c/MagickPNGWarningHandler/1654. convert: Read Exception `/tmp/localcopy_616077cbf1f7.png' @ error/png.c/MagickPNGErrorHandler/1628. convert: no images defined `/tmp/transform_e47092c10939.png' @ error/convert.c/ConvertImageCommand/3258. In-game joystick and keyboard control settings. Error creating thumbnail: convert: Expected 8192 bytes; found 8056 bytes `/tmp/localcopy_4f1983bec231.png' @ warning/png.c/MagickPNGWarningHandler/1654. convert: Read Exception `/tmp/localcopy_4f1983bec231.png' @ error/png.c/MagickPNGErrorHandler/1628. convert: no images defined `/tmp/transform_924d3c328387.png' @ error/convert.c/ConvertImageCommand/3258. Error creating thumbnail: convert: Expected 8192 bytes; found 8056 bytes `/tmp/localcopy_0e60b7b63f33.png' @ warning/png.c/MagickPNGWarningHandler/1654. convert: Read Exception `/tmp/localcopy_0e60b7b63f33.png' @ error/png.c/MagickPNGErrorHandler/1628. convert: no images defined `/tmp/transform_9a67caf19b4c.png' @ error/convert.c/ConvertImageCommand/3258. Error creating thumbnail: convert: Expected 8192 bytes; found 8056 bytes `/tmp/localcopy_24d4867dba0d.png' @ warning/png.c/MagickPNGWarningHandler/1654. convert: Read Exception `/tmp/localcopy_24d4867dba0d.png' @ error/png.c/MagickPNGErrorHandler/1628. convert: no images defined `/tmp/transform_dd3de61ad32e.png' @ error/convert.c/ConvertImageCommand/3258. Error creating thumbnail: convert: Expected 8192 bytes; found 8056 bytes `/tmp/localcopy_a4452e38683a.png' @ warning/png.c/MagickPNGWarningHandler/1654. convert: Read Exception `/tmp/localcopy_a4452e38683a.png' @ error/png.c/MagickPNGErrorHandler/1628. convert: no images defined `/tmp/transform_c4d78e798ff9.png' @ error/convert.c/ConvertImageCommand/3258. In-game strike mode control bindings. Error creating thumbnail: convert: Expected 8192 bytes; found 8056 bytes `/tmp/localcopy_9dfa7712706f.png' @ warning/png.c/MagickPNGWarningHandler/1654. convert: Read Exception `/tmp/localcopy_9dfa7712706f.png' @ error/png.c/MagickPNGErrorHandler/1628. convert: no images defined `/tmp/transform_0ca253f73879.png' @ error/convert.c/ConvertImageCommand/3258. Error creating thumbnail: convert: Expected 8192 bytes; found 8056 bytes `/tmp/localcopy_c2925eaa121b.png' @ warning/png.c/MagickPNGWarningHandler/1654. convert: Read Exception `/tmp/localcopy_c2925eaa121b.png' @ error/png.c/MagickPNGErrorHandler/1628. convert: no images defined `/tmp/transform_0f9da7bb364c.png' @ error/convert.c/ConvertImageCommand/3258. Error creating thumbnail: convert: Expected 8192 bytes; found 8056 bytes `/tmp/localcopy_70a7f81dcd2d.png' @ warning/png.c/MagickPNGWarningHandler/1654. convert: Read Exception `/tmp/localcopy_70a7f81dcd2d.png' @ error/png.c/MagickPNGErrorHandler/1628. convert: no images defined `/tmp/transform_ac2cdd954f90.png' @ error/convert.c/ConvertImageCommand/3258. DK2 only. Add OculusRift OculusUIProperties=OculusRift.txt to launch options. LibOVRWrapper might work for this game. In missions, the FOV is always higher by 8.4 than set in option menu. This can be seen in a mission when you open the options menu. The developers had planned to update the game with a more detailed shadow solution. However, due to various issues this was never fully implemented, despite the setting being available in the graphics menu. For some users the game does not go above 50 fps. While the reason for this is unknown, a workaround for Nvidia users is to leave the GeForce Experience window open in the background. Another confirmed solution is to use a hardware accelerated media player like MPC-HC, play and then pause a video file (like those found in <path-to-game>\pc\main\Video\) and keeping the player open before starting the game. Sometimes after using Alt+Tab ↹, the game is stuck in windowed mode. Go to options menu and change to windowed. After changing to windowed, change back to fullscreen. 32-bit executable also available, but not officially supported. Only 64-bit operating systems are officially supported. ↑ 2.0 2.1 File/folder structure within this directory reflects the path(s) listed for Windows and/or Steam game data (use Wine regedit to access Windows registry paths). Games with Steam Cloud support may store data in ~/.steam/steam/userdata/<user-id>/288370/ in addition to or instead of this directory. The app ID (288370) may differ in some cases. Treat backslashes as forward slashes. See the glossary page for details. This page was last edited on 11 April 2019, at 21:19.